French Immersion Day, hosted by the university’s French Club, is in its ninth consecutive year. Organizers expect about 250 high school students to attend this year. 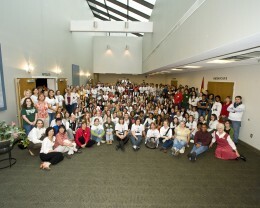 The theme for 2011’s immersion day is African francophone countries, such as Morocco and Ghana. Experts say the best way to learn a language is to surround yourself with people who speak only that language. If you want to learn Japanese, go to Japan. If you want to learn Spanish, go to Spain. If you want to learn French, go to Wright State University’s French Immersion Day. It is popular with high school teachers and students throughout the greater Dayton area and some as far away as Cleveland. French majors at Wright State get experience teaching the language they love. French Immersion Day, hosted by the university’s French Club, is in its ninth consecutive year. Organizers expect about 250 high school students to attend this year. The theme for 2011’s immersion day on Wednesday, Nov. 2 is African francophone countries, such as Morocco and Ghana. Students will take part in four morning activities led by Wright State students. One of the activities is a traditional Moroccan tea service, conducted in French. They will break for lunch, catered by a Lebanese restaurant (Lebanon is an Arabic- and French-speaking country). They will then perform the end to a French play they received prior to immersion day. Participants will be treated to a visit from the Modern Languages department chair, as well as David R. Hopkins, president of Wright State University. Teachers have even reported that students speak French on the bus ride home, even though it’s no longer required. As for the college students, Abadie notes that they benefit just as much as their high school pupils. Most of them want to teach French eventually, Abadie said, so the immersion day is good practice for working with high school students. It’s also just a good chance to practice speaking.